8 SUPER ANGELS arrive the 503rd time on earth and renew the memory (and the knowledge) of the now again androgynous mankind. This is the end of the seventh round. The astronomers destroy their instruments and all monads prepare for the withdraw into nirvana. 2.150.000.000 A.D. - The death of the earth. 30.240.000.000 A.D.- The death of all solar systems. The suns die first, followed by the planets of the corresponding solar system. 1. The suns change shape from gas into dense material. 2. The sunes implodes into countless meteorites. 3. All spirits or monads of mankind will by now be cleansed in their physical, astral and mental bodies - and be ready for cosmic rest in nirvâna. The entire universe with everything in it, explodes in a gigantic fireball, which is absorbed by THE SEVEN RAYS in the root spirit and from there returns to the ever-to-be-unknown PARABRAHMAN. Oh Lanoo, everyone who reaches nirvâna, intensifies Christ awareness. 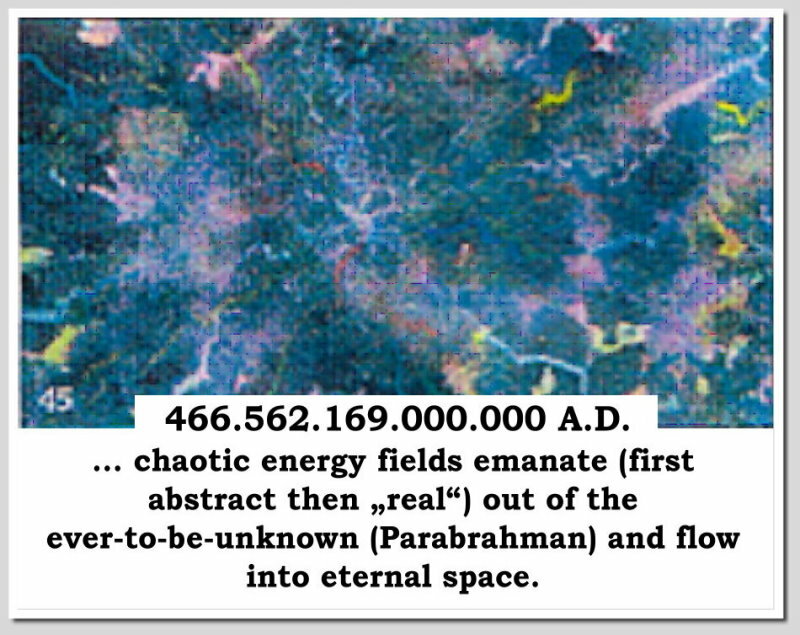 ... chaotic energy fields emanate (first abstract then “real”) out of the ever-to-be-unknown (Parabrahman) and flow into eternal space. 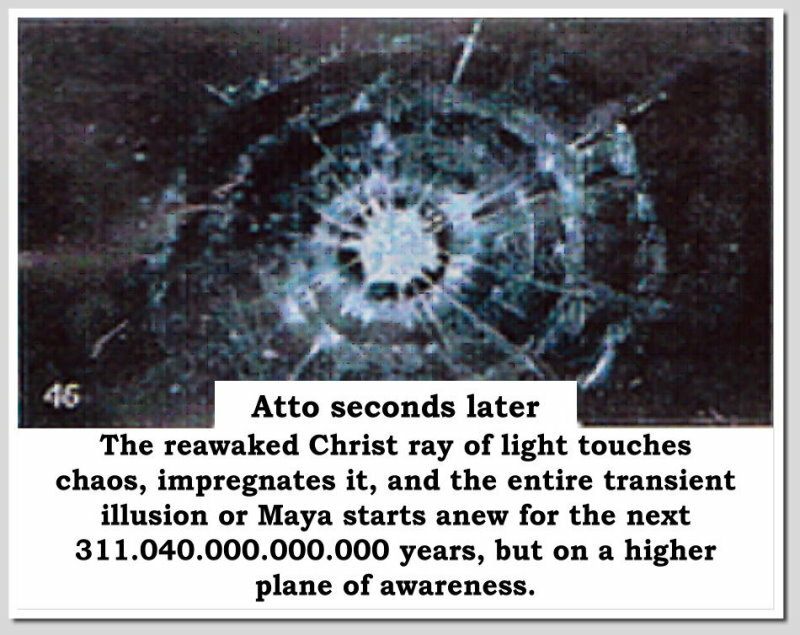 The reawaked Christ ray of light touches chaos, impregnates it, and the entire transient illusion or Maya starts anew for the next 311.040.000.000.000 years, but on a higher plane of awareness. All problems in the world are caused by the loss and lack of esoteric science or theosophy, the doctrine, which once united us all. The return of this wisdom religion, reawakened in “THE BOOK OF LIGHT” will lead to world peace and has nothing to do with the so much feared “new world order” and / or “new world religion”. 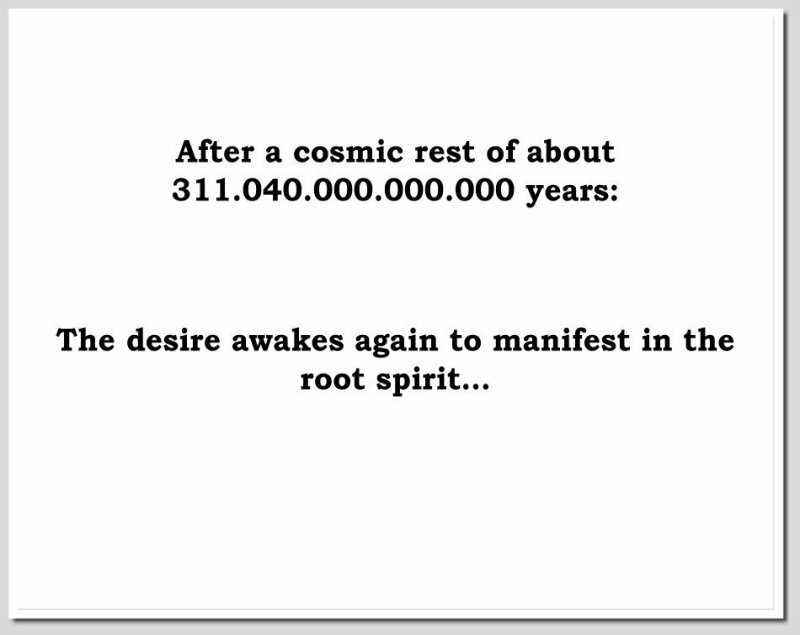 Mankind will finally remember the truth about origin of man and universe and be conscious about it. Man should not rule over man. “THE BOOK OF LIGHT”, BOOK OF BOOKS AND SAVIOR OF MANKIND. AUM. Special thanks to Beate Chaaban, Sonja Hennig, Elisabeth Frauenkron und Andreas Horn, the builders of the "CITY OF LIGHT". And moreover I thank my good friend and editor Elke Straube.